Wasps, as it turns out, come in two varieties: social and solitary. 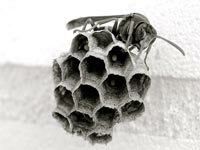 Social wasps have nests, and these are usually the types of wasps that people are trying to get rid of, either because the wasp population has become pestiferous (i.e., noticeable and stingy), or because the wasp nest is too close for comfort. Solitary wasps, on the other hand, are no less intimidating than their social cousins but are indeed much more docile. The fact is solitary wasps have no territory to defend because they often lay their eggs inside of their prey, thus relieving themselves of the burden of building a nest and then defending it. 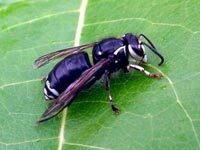 Solitary and other docile species of wasps are good for you because they reduce the populations of many creatures deemed to be pests by humans. Below we will help you identify which kind of wasps you’re dealing with and show you how to get rid of wasps. 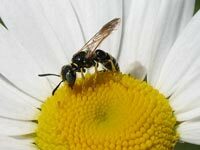 Because a wasp’s stinger is not barbed like a honey bee’s stinger, the wasp can repeatedly sting its victim. A simple and effective wasp sting treatment is to wash the sting with soap and water, take an antihistamine, and apply ice to the sting. 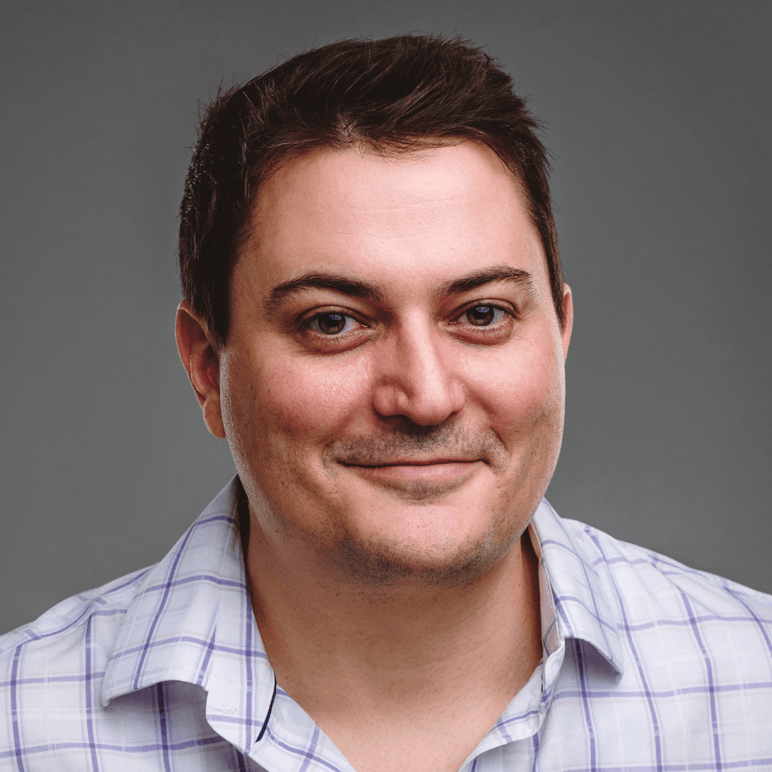 If you are allergic to insect bites of any kind, it is recommended that you seek medical attention immediately, unless you enjoy choking to death. Just don’t say we didn’t warn you. This is a perfect example of the solitary wasp. The solitary wasp usually has a very long, thin body and waist; are not particularly colorful; and are usually quite docile. They are not very territorial and will rarely sting humans. They are not considered pests, but they are considered beneficial insects in the economic and gardening sense, seeing as how they tend to prey on garden pests like aphids and beetles. To get rid of wasps of the solitary variety, simply have a spray bottle filled with citrus oil extract on hand for any pesky individuals. Citrus oil extract kills wasps on contact. Paper wasps are yet another form of beneficial insect and are therefore deemed only a pest if they establish a nest where there happens to be a lot of human traffic. Otherwise, the paper wasp is one of the most harmless species of social wasp, and it’s a real treat to watch them build those amazing nests. Their nests are of a unique structure, much like a honeycomb, without an outer shell like most bee and wasp nests. 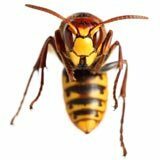 The safest way to get rid of paper wasps is to purchase a can of pressurized wasp killer and spray the nest in a sweeping motion during the night. Hornets are one of the most fearsome looking wasps, but they aren’t looking for trouble. Hornets usually live in large, aerial nests and do a lot of their feeding between dusk and dawn. They are territorial but less aggressive than the yellow jacket. 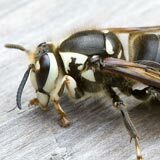 The bald-faced hornet is the most common hornet wasp in the U.S. To get rid of hornets, you should also use a can of pressurized wasp killer to spray the nest from a distance during the evening. Bring a flashlight, too, if you’re not certain where the entrance to the nest is. 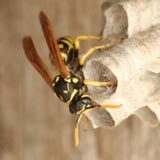 Yellow jackets are easy to identify due to their thick waists and bright yellow patterns. Yellow jacket wasps are extremely territorial and aggressive social wasps. They will defend their nests to the bitter end, biting and stinging their way into the next life, often injecting several doses of poison before being wiped away or killed. 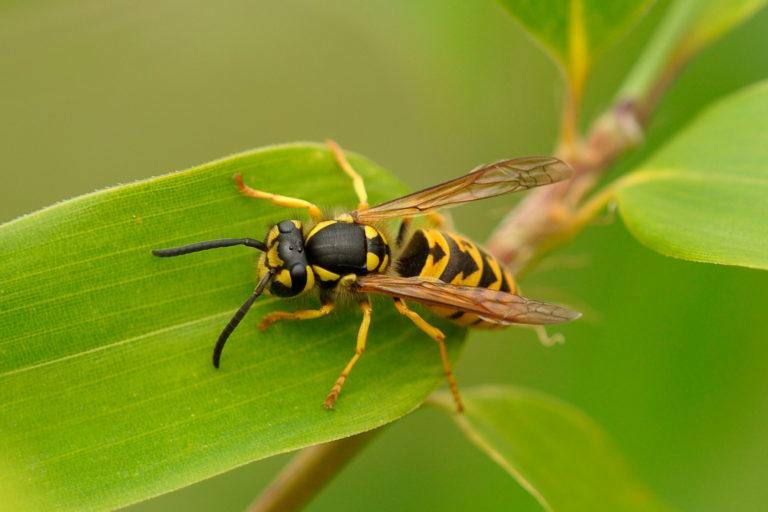 Of all the wasps, the yellow jacket is considered to be the only “pest” in the family. This means you’ll definitely want to know how best to get rid of yellow jackets. 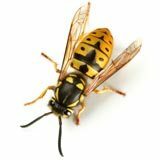 The key to getting rid of yellow jacket wasps is to first identify the nest and then to pump enough poison into the nest to kill all of the yellow jackets in one shot. This is easier said than done. To find the nest, you should wait until dusk when all of the yellow jackets will be returning to the nest. You should be able to pick out a high amount of flying insect traffic in the evening sun. Once you have found the nest, use a can of non-projectile wasp killer to spray the nest later at night. Spraying the nest at night means there is less of a chance that the wasps will come out to fight. Wasp nest removal is a fairly simple process. Finding the nest usually entails a quick survey for heavy wasp traffic during dusk or dawn, when wasps tend to return to the nest. Once the sun is down for the evening and you’ve noticed less traffic near the nest, dress yourself with multiple layers of clothing, and find a pair of gloves, just in case. Then, go out to the nest and spray the entrance with any wasp killing agent, like Raid. Spray liberally, but avoid inhaling too much of the poison. 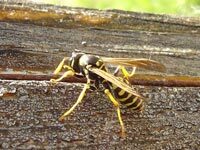 Most wasp poisons kill on contact, but it’s best to be safe by slowly leaving the area, as sudden movements can attract attention. For nests that are located underground, you will want to use a wasp killer that is not labeled as a projectile spray. You want very little spray for yellow jacket nests that are found underground. For nests that are elevated, you will want to find a can of wasp and hornet killer that is labeled as a projectile spray. This will ensure a stream of wasp poison roughly 15–20 feet in length, allowing plenty of distance to make a quick escape if necessary. You can pick up Raid at Amazon. Repeating this process twice or even three times may be necessary until you’re certain the nest has been vacated. Once you see that there is no traffic, it’s probably safe to knock down the nest if it’s an aerial nest, or fill the nest with dirt and gravel if it’s in the ground. This should be the end of your wasp problem until the next migration cycle. Find a 2 liter soda bottle and cut the top 1/3 of it off with a box cutter. Flip the removed top so that the nozzle is facing down, pushing it back into the other 2/3 of the soda bottle to create an inverted cone. Fix the inverted piece of the bottle with several staples to make sure it fits snuggly inside. Partially fill the bottle with wasp attractant, soda, or fruit juice concentrate. Make sure you spill a little on the outside to help accentuate the scent of the attractant. Hang bottle with string or set it on an upended log, or wherever. 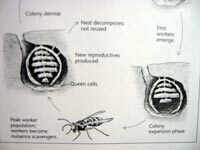 Wasps should enter the bottle and be confused by the conical entrance, leaving them to starve or drown in the liquid. Clean and refill the wasp trap every so often to make sure it doesn’t get really, really gross. Or just wrap a plastic bag around it and throw it in a trash can. If you’d prefer not to mess around building one, you can purchase wasp traps from Amazon that have attractant in them. Boiling water, or Yellow Jacket stew, as I like to call it, is the order of the day for a yellow jacket nest; that is, if you’re not into spraying poisons all over your lawn. The idea is quite simple. Find a yellow jacket nest by surveying for traffic. Once you’re certain you’ve found the nest, boil a very large pot of water. Then, pour the boiling water into the nest late at night when the wasps are sleeping. This isn’t exactly the most humane way to get rid of wasps, and it’s not necessarily the most effective way, either, but if you’ve been stung recently, I can’t think of a sweeter revenge. Citrus oil extract is starting to see more use as a botanical insecticide. The active ingredients limonene and linalool usually result in near instant death when they come into contact with a wasp. Having a bottle of citrus oil extract on hand while gardening is a great way to kill rogue wasps and continue your work in the garden. There is some controversy about limonene and linalool’s toxicity to mammals. The verdict is still out on it, so, as always, use with care.